It's been a long time since I've done a "Costume Analytics," but now is a good time to bring it back! This time we'll be looking at the famous Madame de Pompadour's Robe a la Francaise, gushing with lace, bows, and ruffles. What I love about this painting by Boucher, c. 1750, is that it is not the typical Madame de P. portrait, of which there are many. This painting is loosely painted, in a wonderful limited color palette, and is very "alive." It helps that Pompadour is wearing an awesome dress, too! So let's take a look at this gorgeous green gown. 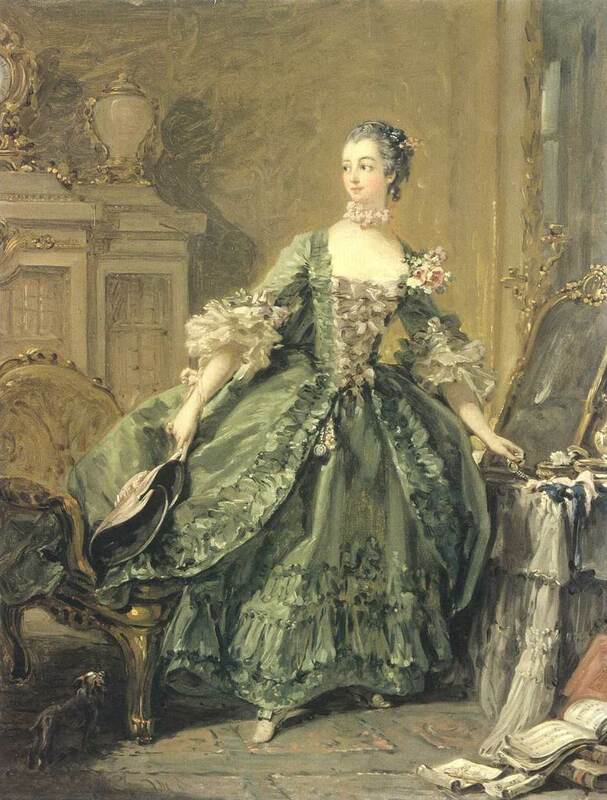 Madame de Pompadour is wearing a Robe a la Francaise, also known as a sacque, sack-back, or Watteau gown. In the 1750s, these gowns were worn over large side hoops called paniers, which held the skirts out on the side, but allowed the drapery from the back to hang in a nice, flat cascade. Robe a la Francaise gowns typically had a matching petticoat, like we see on Pompadour, and were worn over a separate stomacher that often contrasted. Gowns like this one were open in the front, pinning closed at the sides of the stomacher. Madame de Pompadour exhibits a busting breast of bows on the stomachers in many of her portraits, but a completely different stomacher could be switched out to give the ensemble a different look. Madame de Pompadour is wearing silk in this portrait. There is no pattern or figure in the silk, and it was most likely taffeta, a "papery" sort of tightly-woven silk that creates structure and volume. 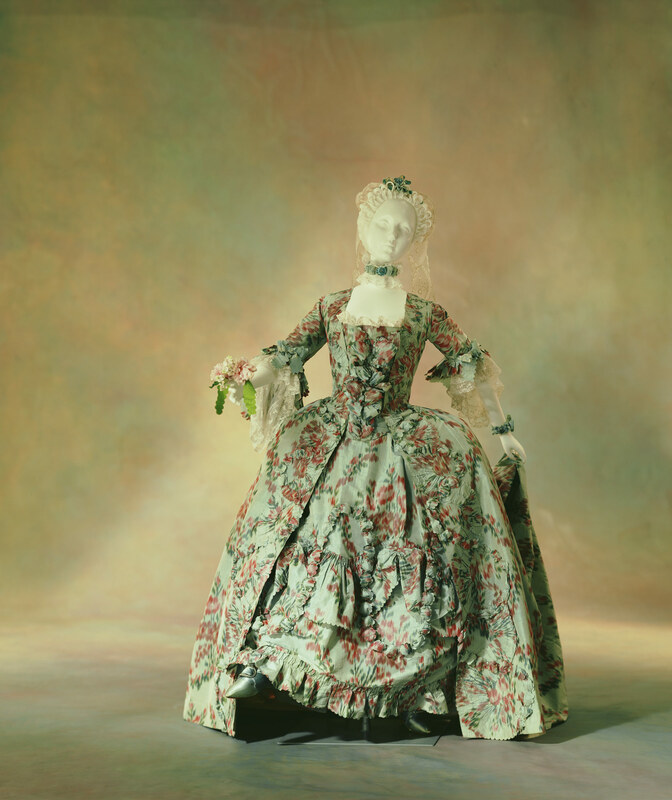 In the 18th century, silks were very tightly woven, and very high quality. The sort of pinked trim we see on Madame P's gown would only have been done on a tight silk, lest it fray. Aside from the overall fabric, Pompadour is also sporting very fine, almost transparent sleeve ruffles It is difficult to tell in the painting what they are made of, but sleeve ruffles from this time were typically constructed of fine laces, and embroidered lawns and voiles. Lastly, the bows on Madame Pompadour's stomacher are probably silk ribbon, much like this gown from the Kyoto Costume Institute . However, bows could also be cut from contrasting fabric, with pinked edges. 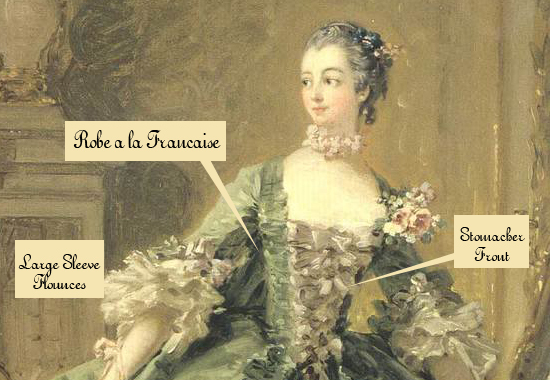 Madame de Pompadour really knew how to complete her outfits with accessories. She was famous for her hair stylings, designed and executed by Legros de Rumigny, but also sported the iconic lace choker we so associate with this period in France. Pompadour is also wearing a rather large bouquet at the shoulder of her dress, as opposed to at the center front, which comes along later. Dangling under her stomacher point is a chatelaine, which would have included items like a watch, needle case, possibly keys, scissors, etc. Pompadour is standing at her dressing table, grabbing a piece of jewelry (a bracelet?) on her way out. She has an interesting hat in hand, what appears to be a bergere style straw hat, a very popular "shepherdess" style hat typically trimmed with ribbons and flowers. Madame P's looks rather simple, surprisingly, in comparison to the rest of her costume. Lastly, Madame de Pompadour has on some very tiny (she was always depicted with teeny tiny feet), pointed shoes, with Louis heels and silver buckles. These types of heels even came to be known as "Pompadour heels," and remained popular until the 1760s. Luckily there are lots of Robe a la Francaise patterns available! Try JP Ryan, Reconstructing History, or Mill Farm. 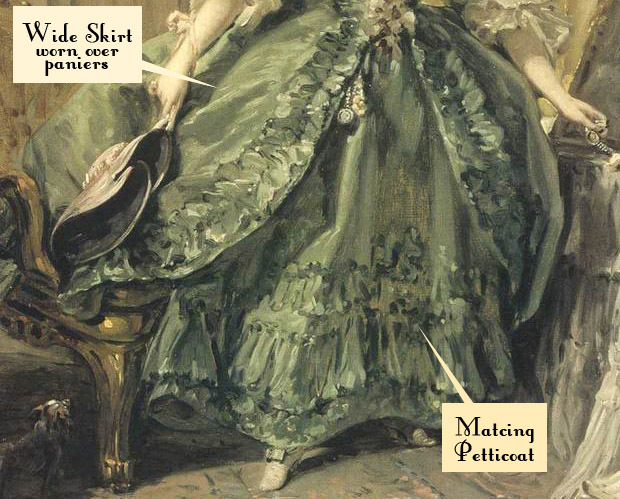 You will also need the proper underpinnings - stays, paniers, and at least one petticoat. The same pattern makers listed above also have patterns for the undies. 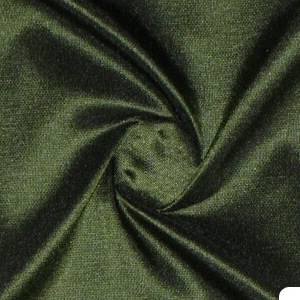 Silk taffetas run around $20/yard, but look for bargains at Renaissance Fabrics, Pure Silks, Decorative Silks, and Silk Baron. Any real straw hat can be turned into a bergere style of your choosing. If you're looking for hat blanks with a shallow crown, try Top-Hats.com. I'll supply the shoes - www.american-duchess.com for dyeable silk, leather, and Pompadour heels. Wow. I learned so much. I had no idea these were separate pieces, but it makes sense. And all the details you noticed! I know this takes a long time to gather these materials to post and a lifetime of knowledge to back it up. Thank you so much. Hooray! Thank you so much, I've really missed costume analytics. Do you take requests? If, for example, someone had their heart set on a particular costume but didn't know where to start? Such a lovely painting, perfect for spring, but I don't believe for one second that her feet were that small. Thank you, I will. It may take some time though, I am exceptionally bad with computers, which is the only reason my comments are anonymous. 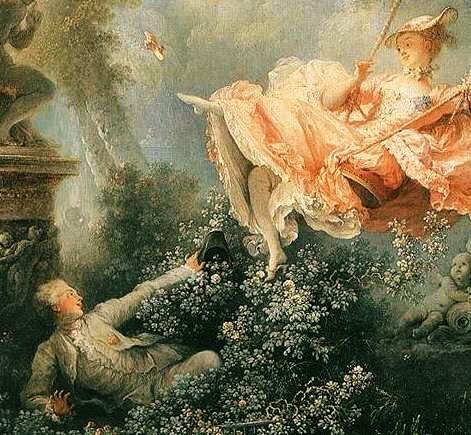 One of my favorite images of Madame de Pompadour is going all out with the turquerie to the point of wearing harem pants! Whoa! I can't believe I've never seen this awesome image before!! Thank you for making my day! And is that something vaguely of a stripey plaid with checkered shoes? You don't see that much. Or at least I haven't. Of course, real tartan plaid didn't come into vogue as a fabric outside of Scottish male garments prior to the Dress Act of 1746 (repealed in 1782) until King George IV popularized it in 1822. This is why you see plaid on many dresses in the 19th century, but almost never before (and Scottish women never wore tartan, but stripes or just the same as what English women wore). Of course, the clan tartan is a 19th century myth. That is indeed a plaid, but definitely not a tartan, as you pointed out. Plaids are rare to see in 18th century textiles, but did exist. Stripes and floral seemed far more in abundance, at least in what we have surviving in museums. Fascinating info about the Dress Act of 1746. I did not know this about tartan! Actually, the more you look, the more plaid francaises you find. Considering how little survives from what actually existed, I find these three very similar examples reason enough to believe that this was a particular trend. All three have the same distinct checkered pattern that doesn't feature squares but rectangles. The one in the post is from the KCI in Japan. I wouldn't say it has anything to do with Scotland - not everything checkered is a tartan, after all. True tartan has a particular weave. I just stumbled upon your blog! What a great post - thanks for the analysis! That KCI piece was my favorite of the whole show when it was at FIT. It appears greener in the photo than it actually is. I am scheming to create a miniature of it, faking the chine silk with Dye-na-flo painting on a similar background color. Seems to work, at least in small scale.